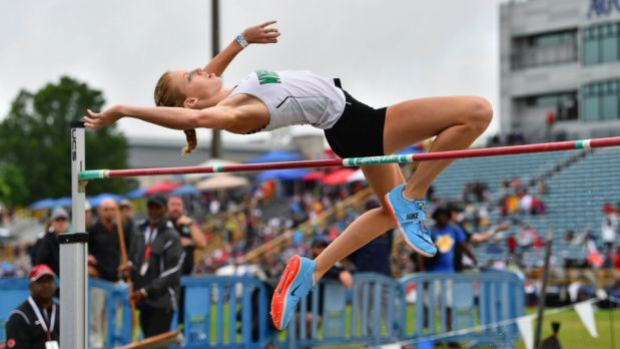 It's been a historic year for the Girls High Jump in North Carolina where Morgan Smalls (Panther Creek), Kenya Livingston (Rocky River), and Addie Renner (Myers Park) have been some of the best in state history. The trio hold seasons best of 6-0.25, 5-10.5 and 6-9.25 respectively. The three were also all All-Americans in the indoor season. Morgan Smalls didn't attend New Balance Outdoor Nationals but took on the nations best u20 athletes at the USATF Junior National Championships. The top two in the event would qualify for the USA World Junior team heading to Finland later this summer. Smalls was just one inch off of qualifying for her first Team USA where she jumped 5-11.75 taking 3rd. Her fellow North Carolina competitors held it down during her absence in Greensboro adding on two All-American performances. Indoors Livingston was the National Runner-Up in a tiebreak off misses. Livingston had cleared her way through 5-8.75 with no misses. Renner sat in the same boat as the bar was raised to 5-10.5. This would be a PR height for both girls. Through two attempts the bar was cleared by competitors Shelby Tyler (IN) and Nyagoa Bayak (ME). 7 other girls were hoping to join them on the final attempt. Renner would miss on her final attempt, but with no prior misses in the competition, she was in a good spot for an All-American finish. Livingston went on to clear the height setting a new PR. She'd cleared 5-10 twice, once as a sophomore and once as a junior. Thea Shaw (DC) joined to make it four girls over 5-10.5. The bar moved up to 6 feet for the remaining four girls. Coming down to a tiebreak on misses for 5th and 6th from 5 girls, Renner had secured 5th place in the competition earning All-American status for the second time this year! Renner was also 4th at Indoor Nationals this season. None of the four girls would clear 6-0, which means the national champ would be Tyler and Bayak the runner-up with zero and one miss respectively. Livingston closes one of the best High School careers North Carolina has ever seen with her second All-American performance as a senior. Livingston didn't compete with her school this outdoor season and we didn't really see her compete much in the outdoor season. She competed twice in wet conditions clearing 5-6 both meets. Despite the lack of competition Livingston still was able to rise to the occasion when it mattered most. Both Livingston and Renner will call it a year as Livingston heads to Clemson to start her college career in the next few weeks. Renner will take some time off as she'll look to gear up for her senior season at Myers Park. Also, Cary freshman Teonni Key took 10th setting a PR of 5-7 in her first national championship. She should certainly join Smalls and Livingston as North Carolina high jumpers contending for national championships next year.